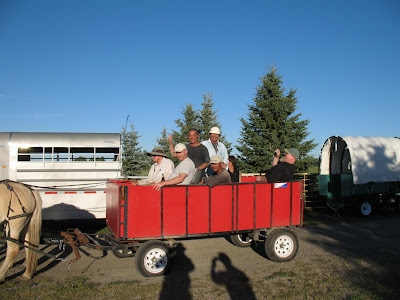 After supper we all went to Wendy Tredger's for a horse back ride. 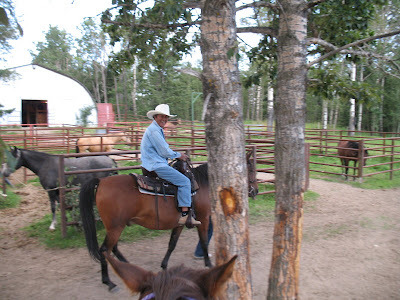 After a little practise in the arena we went out for a ride in the trees around the beautiful property. 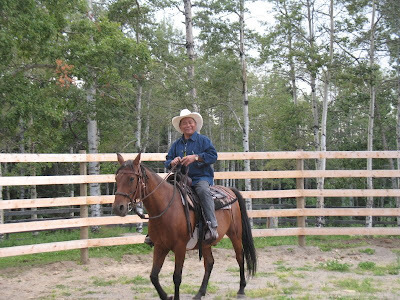 Peerapong is a natural John Wayne. 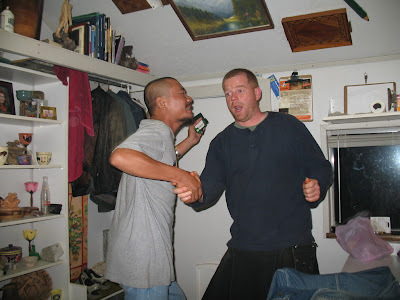 Paul got the hang of it right away, I think he's riden before. There were about 500 pictures taken before we got on the horses. 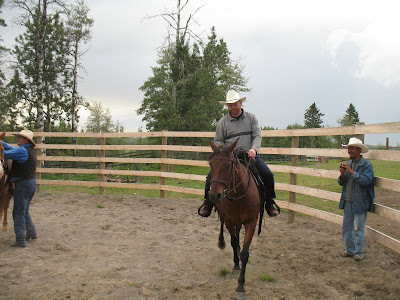 Wendy and Randy saddled up 6 horses when we got there which was really neat for the guys to see. 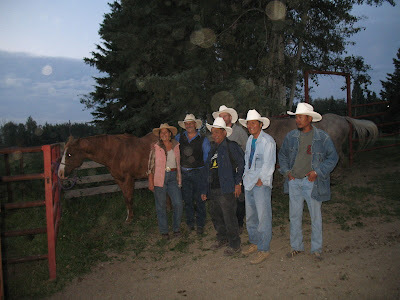 Everyone got a big kick out of the horse back riding, they got to put the hats from the Calgary White Hat Ceremony to good use. When you gotta go you gotta go, I'm really just barely having time to get a few pictures up each day. 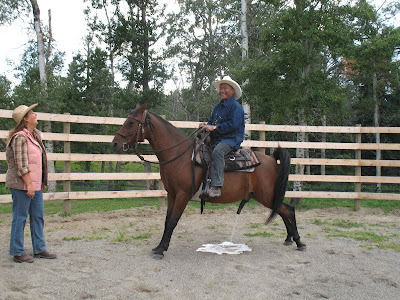 Peerapong's horse decided to get a little relief just before we went on the trail, we all had a great big laugh. 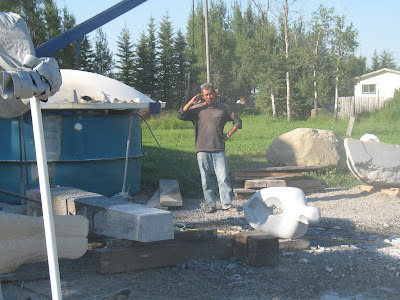 Vahe's sea shells change each day, it is exciting to watch the evolution of all of these sculptures. 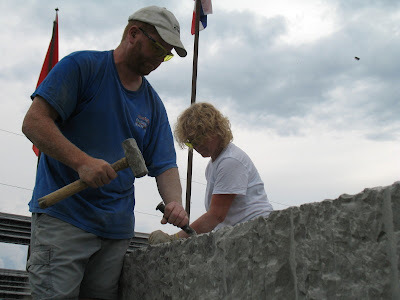 We poured the pad for Paul's cross today, he will be ready to place it before we pour the bases for the others. A celtic cross is always placed with the arms north and south so that the morning and evening sun will shine through the "lights" of the cross. This picture is taken facing east, it will be spectacular from the house in the mornings. 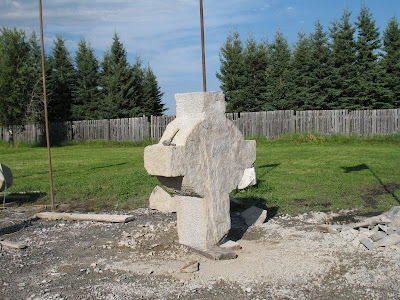 It looks like the cross will be about 16 feet tall when installed. Volunteers Shirley Paradise from Okotoks and Christine Pender from Dewinton installed the art show and are doing an awesome job of cooking. 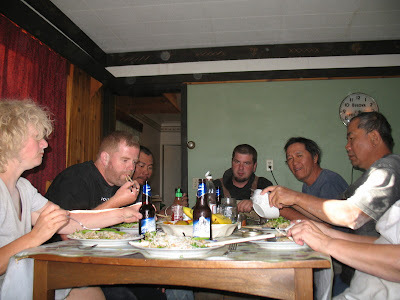 Tia brought out a home cooked Thai meal, everyone loved it (especialy Peerapong). "Movement in Space" is developing quickly. You can see the childs face now. The front of Cuong's hand is nearly finished, I think he will create a surface on most of the back side and then start polishing. We are trying lots of different ideas to find the pearl that will be cradled in the palm of the hand. There's light at the end of the tunnel. 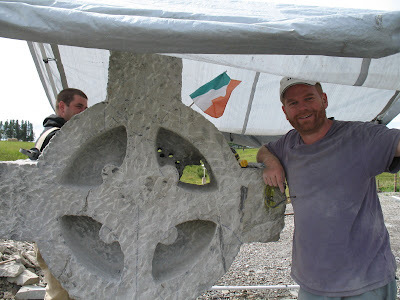 Paul Haggins has opened up one of the "lights" on his celtic cross. 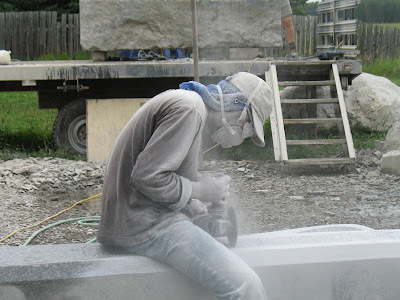 Hung's column is his main focus now, he will polish the figure later. Now he is working to ensure that creating the form of the column doesn't drag into the final days of the symposium, we only have 11 days left until we begin installing the sculptures. Peerapong is back to using the big saw again today, and taking off some sizeable pieces, he hopes to start detailing in 2 days. 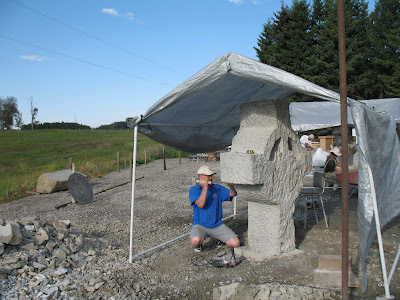 Hung is cutting a recess in one face of his column, he has already cut the edges at a 45 deg angle. Eileen worked on Paul's shaft for part of the day. 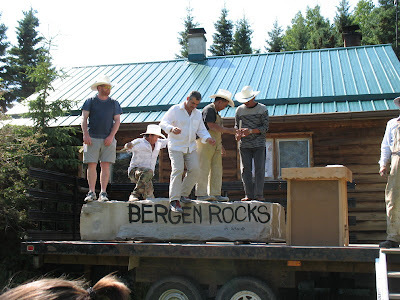 After work tonight we went over to the neighbor's (Ed Stacy) and he took us all for a ride in his wagon with a team beautiful of Norwegian Fiords that he raises. 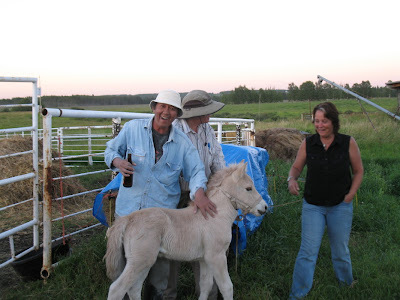 Ed has several of these beautiful horses, he has been raising them for a couple of decades. This colt was born on Sunday and another was born this morning. Ed is already working toward breaking this little guy, he can handle his feet, ears, tail etc. This was a super western experience for everyone. 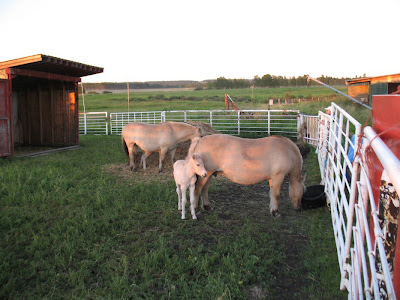 You can just see the legs of the colt that was born today beside the mare in the background, mama was pretty protective, the one in the foreground is the one that Ed caught and we had a chance to pet. 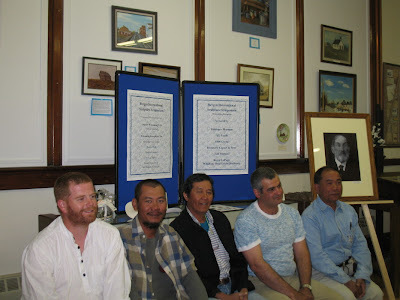 A welcoming reception was held at the Didsbury Museum tonight. It was a very nice event, wine and cheese and the whole nine yards. The posters behind the artists list the sponsors of the welcoming reception and gifts that were presented tonight. There is still a lot of work to do but it is nice to take a break once in a while. 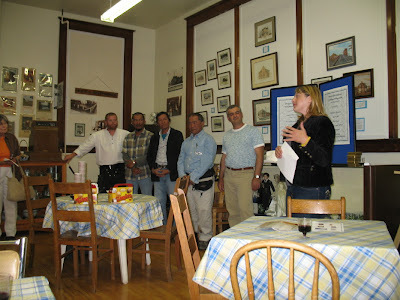 Presentations were made on behalf of Prairies 2 Peaks, Alberta Tourism and Olds/Didsbury MLA Gary Mar. Municipalities from the surrounding area contributed gift packs, many local officials attended. I'd like to thank those that took the time to recognize these fellas and thank them for thier work and the legacy that they will leave here. 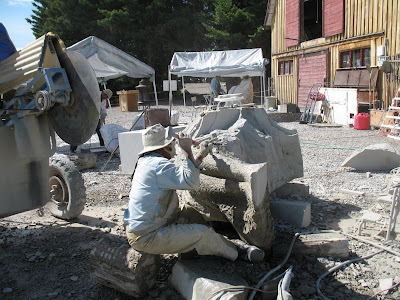 The sculptures should have a life span of at least 1000 years, they will add to our culture for centuries. 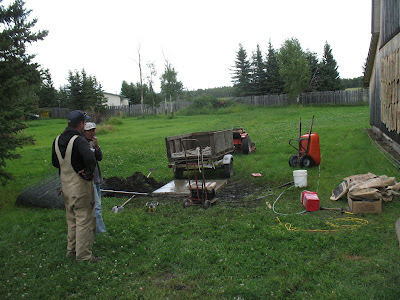 Today was our first day off, last Tuesday the guys decided to forgo a break and work on the Tuesday. 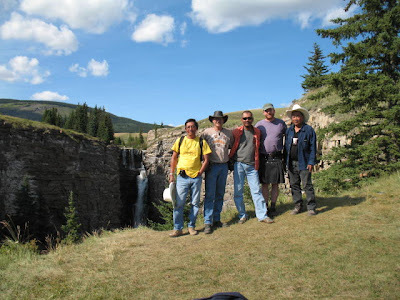 The symposium was supposed to begin on Saturday but they started on Friday, then they skipped the day off on Tues.
We spent the day driving west of Sundre, visited Limestone Mountain, Bighorn Falls etc. Driving out through Bearberry and back on the Mountainaire Lodge Road provided a beautiful circle tour of our back country. 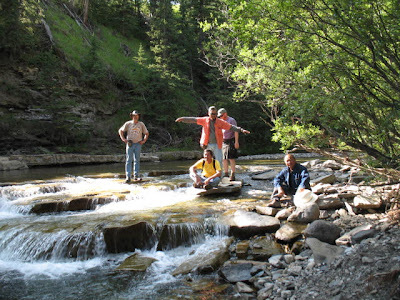 The hike up to the falls provided a photo op at every corner. This litlle staircase had a beam of light coming onto it through the canyon. Today was a great day for sculpting, scattered clouds kept the sun subdued enough that it didn't quite get hot like it was over the weekend. Hungs figure is coming along well. He has the negative space in the center cut right through now, I think we will roll it over on Wednesday so that he can work on the other side. 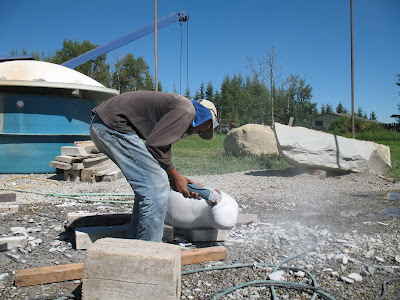 Peerapong is creating detail on what will be the top of his sculpture already, here he is using a point chisel to remove material and create texture. 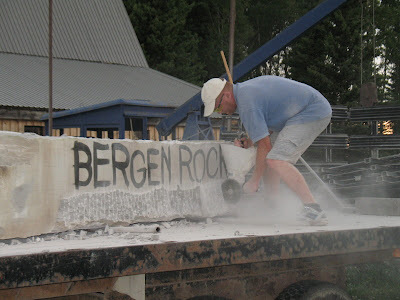 How many thousand times each day does he strike that chisel? Last night we had this beautiful cake for desert after supper, my family had it specialy decorated with mountains, a stream, trees etc. Shirley boiled up rhubarb from my garden to put on it along with ice cream. 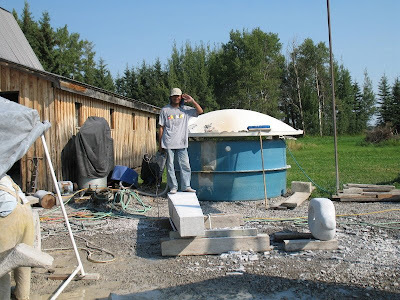 We have to start thinking about placement now, two of the sculptures require concrete pads poured below surface, the other 3 will need some ground preperation. So that they can be exhibited for the closing ceremony, we will have to start on that before the weekend. 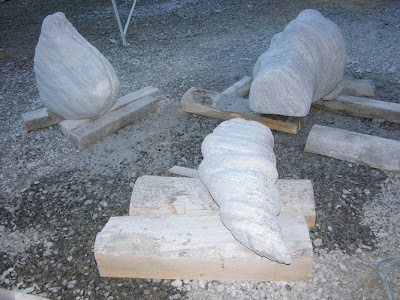 Tommorrow is a day off, I think we'll take an hour or so in the afternoon to consider where this group of sculptures will be placed. 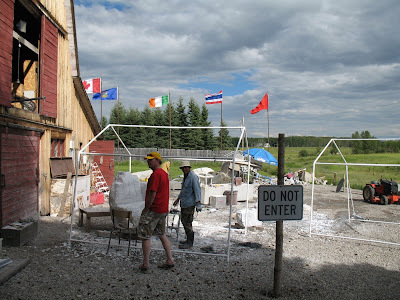 Stephen Pope, a volunteer from Okotoks assisted Cuong for part of the day, it was quite hot today. Thankfully there was a bit of a breeze most of the day, unfortunately the wind has to blow in someone's direction and the spray from the saw had Hung dressed in a wet suit most of the day. The ole saw got a big face lift with a color coordinated umbrella. 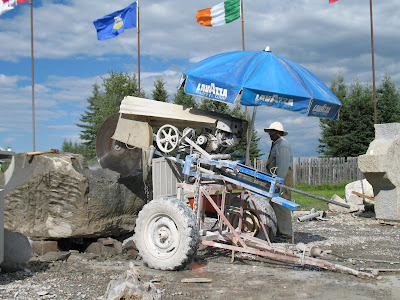 Not only does it provide some shade for the operator but it also helps to keep the motor a little dryer and cleaner. Uptown!! The top portion of Pauls cross is seen on the far right. 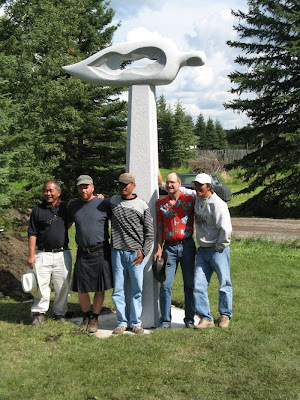 After extending the shaft and adding a base this sculpture may stand 16ft tall when it is completed. 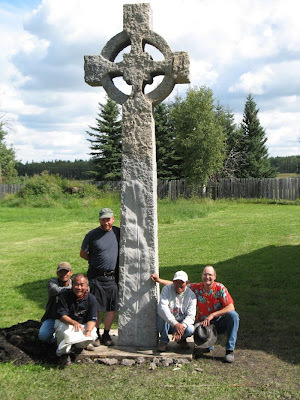 A pose around Paul's Celtic Cross. The cross represents Irish tradition and culture, he carved a feather on the face of the shaft which to him represents Canadian heritage. Works for me!!! 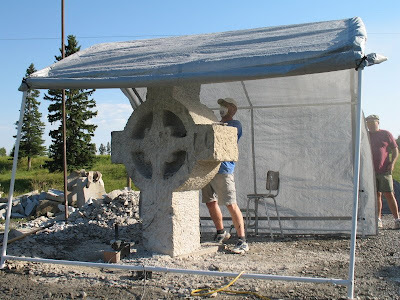 A full shot of the Celtic Cross, it is placed with the arms north and south so that in the morning and evening as the sun rises and sets the light shines through the "lights". Every morning I will be able to see the lights will be shining right at the window of my house if I get up with the sun. 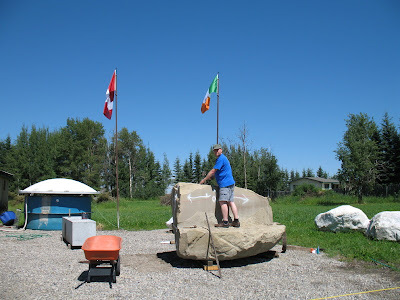 Eileen Hiedler from Edmonton has been down a few times over the last couple of weeks, the volunteers from the SAA have been a huge help with site prep, signage, meals.....and gets a chance here to get here hands on the stone.Well everyone is pulling together on things that simply need to be done, volunteerism has been awesome. 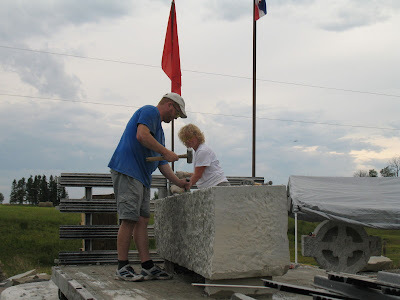 Now that the top of the cross is laid out Paul starts on the shaft. 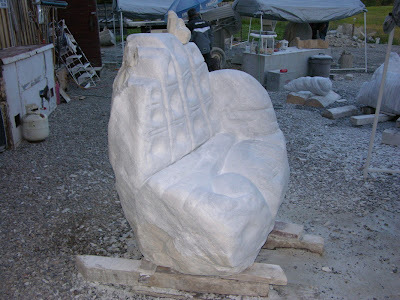 The two pieces will be assembled before he does the finishing work. 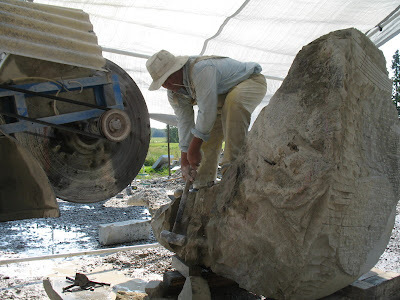 Sawing, drilling and chiseling is noisey and dusty, provides excellent photo ops and just plain ole interesting/exciting to watch. Here the lights are becoming more defined/detailed. The "lights" are marked out on one side of the cross here, he has started to remove material from the top two. 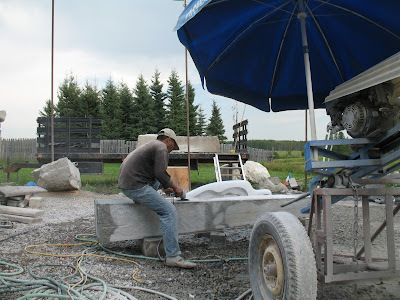 Paul's stone wieghed 34,900lb, he will cleave it into several peices. The finished cross will likely be about 12 feet tall. 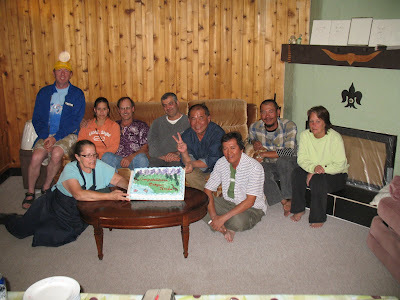 The night everyone came in we stayed up for a while after getting home and had a nice time renewing aquaintences. 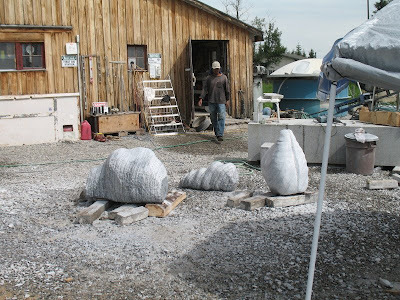 Vahe did a triptic of sea shells, a landscape sculpture. 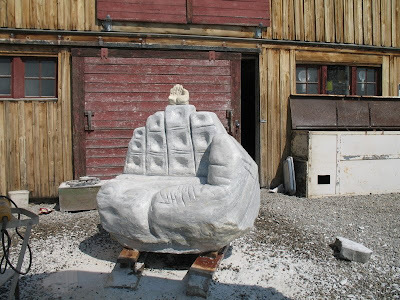 Each sculpture is different and I think that there are few people that would not enjoy all of them. 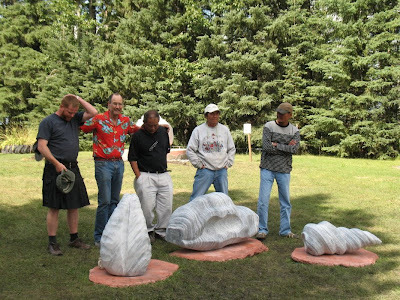 I hope the public will feel free to come out and experience these sculptures when the park is open, I hope to establish days and times that this grassroots begining of a sculpture park will be accessable to the public for the summer of 2009. 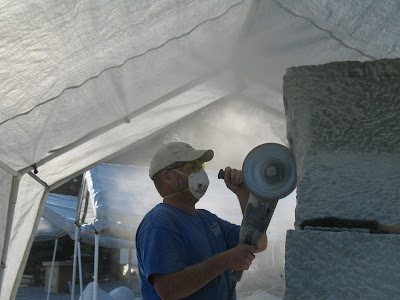 This winter I will have to tarp them I think as I likely won't have time to put a coating of protectant on them, my fall is pretty booked up......read on. 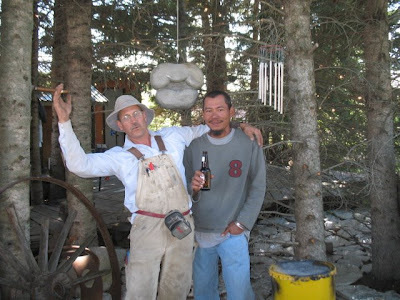 "Ying and Yang" shortly after it was installed. Should look about the same after 1000 years and with proper care much longer. 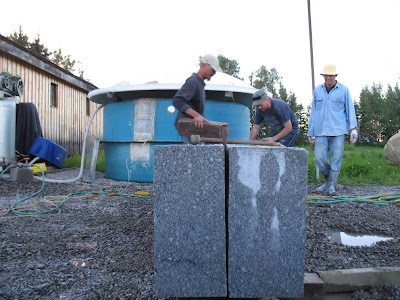 Dirt will be placed on the slab and seeded with grass, as with "Movement in Space" they will appear to rise more dramatically, right out of the ground. 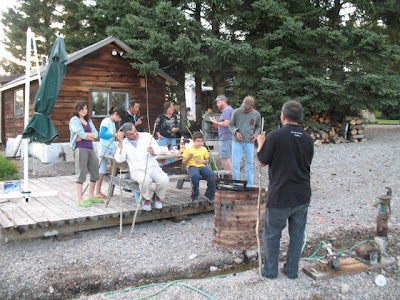 Of course we all have to pose after the work is successful. Hung finished up with a few days to spare so he carved this set of lips from sandstone and hung in in the trees near my house. It is the 12 month mistletoe, so get caught under it and you are obliged to have a passionate kiss. Cutting the face into the figure. 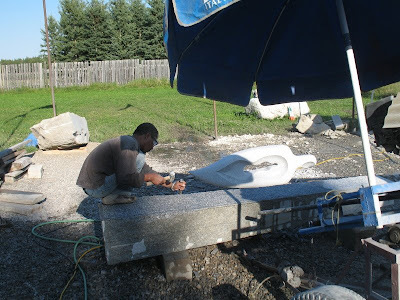 A good view of the figure that will lay on top of the upright column. 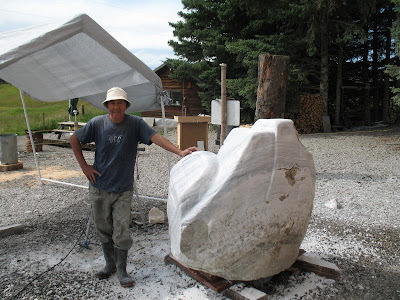 The marble column is cleaved in two, Hung will use almost all of this material for his sculpture. 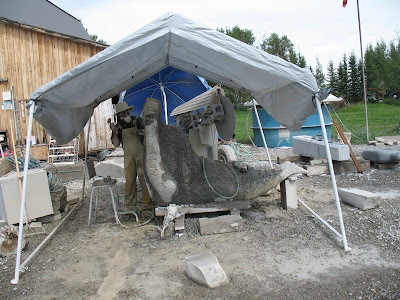 7000 lbs of granite. 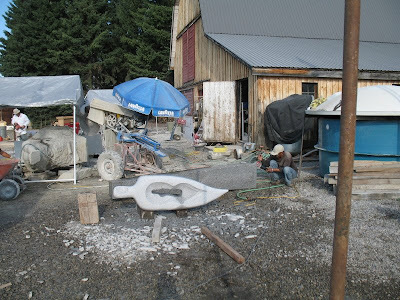 Today we cleaned up his work area, after taking two large chunks away only the two pieces that will make his sculpture remain. 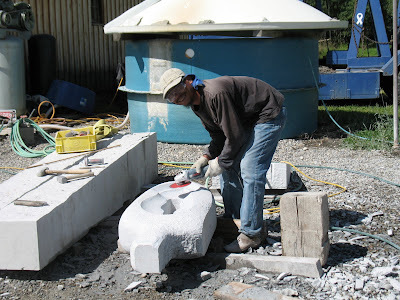 Carving a shape into the column. 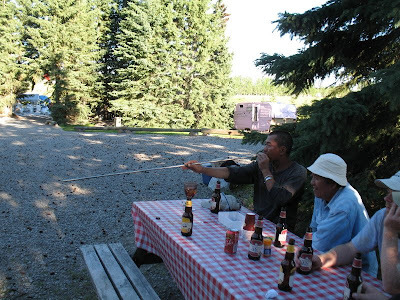 At lunch and supper we have a little fun sometimes, Hung shows off his skill shooting clay balls into a bottle.